Wellington's campaign of 1813 saw his combined British-Portuguese-Spanish army of 79,000 strike northwards towards Burgos without allowing Joseph's French armies to concentrate. From Burgos, Wellington out-manoeuvred Joseph by wheeling through the mountains to the north. On 19th June, Joseph's combined force of 66,000 began to take up a defensive position west of the town of Vitoria. The French position was enclosed to the south by the Heights of Puebla and to the west and north by the Zadorra river. Surprisingly, none of the bridges spanning the Zadorra were destroyed. Joseph deployed his forces in three parallel lines facing west, the expected direction of attack. The front line was commanded by Gazan, the second by D'Erlon and the third by Reille. Between the French first and second lines stood the Knoll of Arinez from where Joseph exercised command. Wellington, while having no intention of attempting a direct attack from the west, had to move quickly before Joseph received support from Clausel's approaching army. At 8am on 21st June, Wellington's co-ordinated attack was opened by Hill's 2nd Division, Morillo's division of Spanish infantry and Cadogan's Brigade crossing the Zadorra at Puebla to attack the heights overlooking the French position. Shortly afterwards - and some 15km to the east - Graham's force comprising the 1st and 5th Divisions, Pack's and Bradford's Portuguese Brigades and Longa's Spanish Brigade began to press from the north against the road from Vitoria to Bayonne. By noon the road had been cut. Crucially, Wellington learned late in the morning that the French had left the bridge across the Zadorra at Trespuentes unguarded. Kempt's Brigade was immediately despatched from the Light Division to seize the bridge. Concealed by high ground on the hairpin bend of the Zadorra, the light infantry were able to take the bridge virtually unopposed. The pressure on the French position now rapidly became unbearable as allied attacks were pressed home from several directions. Picton's 3rd Division - supported by a flanking attack by Kempt's Brigade - stormed over the Zadorra to the east of Trespuentes. 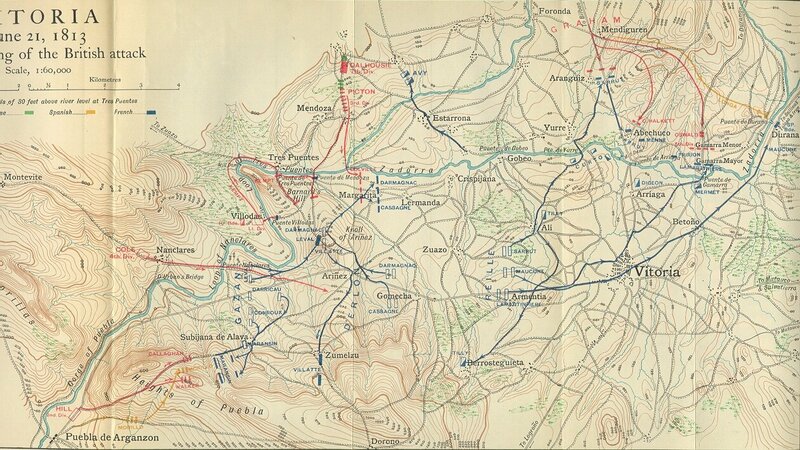 From the west, Cole's 4th Division and the rest of Alten's Light Division crossed the Zadorra. Meanwhile, Hill continued to press from the south. Throughout the afternoon, the French were gradually rolled-up from the west before being finally sent into headlong retreat. Wellington's casualties from the battle amounted to 5,100. Joseph suffered not only 8,000 casualties but also the loss of virtually all his artillery and transport. Joseph's army was spent as a fighting force. The battlefield of Vitoria is another of those in the Peninsula to have been bisected by a motorway, in this case the N1. The unguarded bridge by which Kempt's Brigade crossed the Zadorra has remained intact however, and makes a rewarding visit. The easiest approach is to leave the N102 10km west of Vitoria (Gasteiz) following the road signposted to Mendoza. The Knoll of Arinez lies east of the Mendoza road. 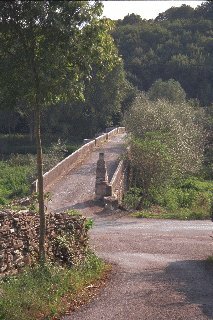 After crossing the Zadorra by a modern bridge, a left turn leads directly to the village of Trespuentes and Kempt's bridge. The hill which shielded Kempt's Brigade from the view of the French, as it rounded the hairpin bend of the Zadorra, is seen slightly south of east from the bridge. "A History of the Peninsular War, Volume VI" by Sir Charles Oman, published by Greenhill Books 1995, ISBN 1853672262. Detailed map of the Battle of Vitoria courtesy of The Napoleon Series.